What do the first four eras of Liberal dominance tell us about the new government’s prospects? It’s back! The Liberal Party that once bestrode the Canadian political system like a colossus, then suffered rapid and humiliating decline into mere third-party status in the last Parliament, once again forms a majority government. That this is under a Prime Minister who happens to be the son of a previous successful Liberal Prime Minister who governed Canada for close to 16 years makes it seem like a political version of Back to the Future. But appearances can be deceiving. Two recent books point to the discontinuity represented in Justin Trudeau’s 21st-century Liberal Party. Foreign policy historian Greg Donaghy has written a biography of an iconic figure in the old “government party” of Mackenzie King, Louis Saint-Laurent and Lester Pearson. Paul Martin, Sr., never achieved the pinnacle of power in the party (not for lack of trying), but he was a prominent minister in Liberal governments over three decades, “Mr. Liberal” to generations of Canadians. Martin’s career describes a political world we have lost, irretrievably. 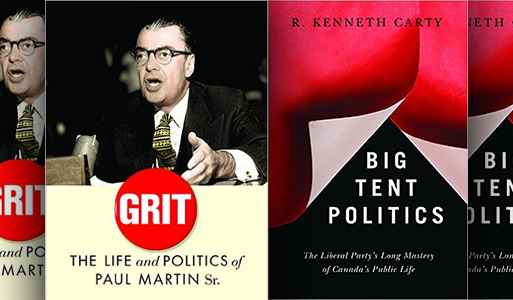 Political scientist Ken Carty, the leading Canadian scholar of political parties and the electoral process, has written a concise and insightful retrospective on what he calls in his subtitle “the Liberal Party’s long mastery of Canada’s public life.” Big Tent Politics appeared, ironically, just on the eve of the spectacular return of the Liberals in late 2015. Carty had certainly not written off the chances of a Liberal return to office, but his look back over a long century of Liberal dominance, from the late 1890s to the early 21st century, did lead him to caution that the party would have to find a way once again to transform itself, “this time abandoning the program and practices of a century.” That is the stiff challenge facing Justin Trudeau as current franchise-holder for the oft-rebranded Liberal Party of Canada. From the further revival under Jean Chrétien in the early 1990s to the collapse of the Paul Martin, Jr., minority in 2006. Martin, Sr., was a product of the first two of these Liberal eras, and to a degree an architect of the second and third eras. Born during the second of Laurier’s four mandates, Martin the boy and young adult was a proud “Laurier Liberal,” an identification that in some sense he never outgrew. Plunging into Liberal politics in his adopted city of Windsor, Ontario, during the Great Depression, Martin sought and won a federal seat in the 1935 election that saw the Liberals returned to office over the battered corpse of the R.B. Bennett Conservatives. The Liberals would remain in office for an unbroken reign of 22 years, during which time Martin advanced initially to the post of parliamentary secretary, and then to the Cabinet in the postwar King and Saint-Laurent governments. Martin was a curiously transitional figure in the 1940s and 1950s, looking back to the Laurier era and forward to the very different future of postwar Canada. The Laurier Liberals were a party based organizationally and financially on patron-client networks. Martin proved a meticulous practitioner of a patronage politics that in the 1930s was still prevalent across the country. As client, a freshman MP, Martin assiduously cultivated his patron the Prime Minister, shamelessly lathering King’s capacious ego and earnestly fulfilling any tasks tossed his way from on high. As patron, building a rock-hard base in Windsor where he won his seat in every election from 1935 to 1965, he carefully dispensed whatever plums were available with an eye always on the health of his political machine and made sure that every economic opportunity for the greater Windsor region was seized and maintained. His genius for this kind of politics was such that he eventually became a kind of patronage legend in his own time. But Martin was living through an era when the importance of patronage was in long-term decline. The heavy policy demands of depression, war and postwar development were enlarging the public sector and transforming the role of national parties from bosses of patron-client machines to managers of the welfare/warfare state. Instead of promising individual rewards for individual contributions, parties were increasingly compelled to focus on offering universal benefits to entire categories of the population. In this historic shift from patronage to bureaucratic politics, Martin was tagged by many as a remnant of the past, an energetic but unimaginative ward-heeler out of place in the new world. This characterization increasingly dogged him as he survived into the third Liberal era of the 1960s and had much to do with his failures to win the party leadership in 1958 and 1968. The ward-heeler image was also largely unfair to Martin. If he saw mastery of the mechanics of politics as crucial to survival, when it came to the ends and objectives of politics he began and remained an idealist, a liberal Liberal who believed that government had an important role in fostering orderly social reform and maintaining social peace by promoting greater equality. He drew this liberalism from Laurier, as well as from liberal Roman Catholic social and political thinkers he had encountered in his early education. Domestic reform was one part of his thinking, but he was drawn as well to a liberal internationalism in foreign affairs that sought diplomatic solutions to conflicts within the framework of strong international organizations and the rule of law. Another element of Laurier liberalism at the core of Martin’s thinking came from his own background as a Franco-Ontarian Catholic. To Martin the most important role of the Liberal Party was to maintain a balance and accommodation between the English- and French-Canadian communities that rested at the heart of the Canadian polity. This was indeed the foundational mission of the Liberals from Laurier to Pierre Trudeau, and to Martin it had to be a guiding light for determining all Liberal policy. As Donaghy points out, Martin brought into politics not only a persistent idealism but also a certain boyish naiveté (especially evident in foreign affairs) that stood in peculiar contrast to his image as a machine politician. Yet it is precisely this odd juxtaposition of apparent innocent idealism with crafty control over the nitty gritty of real politics that has infuriated and bewildered generations of opponents of the Liberal Party. Conservatives and social democrats have often thrown up their hands and charged successive Liberal governments with hypocrisy as they were beaten again and again at the polls by this combination of high-minded rhetoric and effective down-and-dirty tactics in the trenches. Both the practical and idealist sides of the Liberal Party were real and persistent and help account for the party’s long success: without the ability to get out the vote (with whatever that took to accomplish), the grand policy goals could never be achieved; yet mere electoral success without a justifying vision would pall and eventually fail. The vicissitudes of Martin’s ministerial career lead to another observation. Some have discerned a dynamic at work in Canadian political history in which the Liberals have moved left at strategic moments and preempted the emergence of an effective left-wing alternative. This has indeed been the case at crucial points. During Martin’s career there were two such instances: in 1945 the Liberals headed off the CCF with a reform platform, and again during the Pearson minorities in the mid-1960s they expanded the welfare state with an eye to their left flank. But that is only half the story. 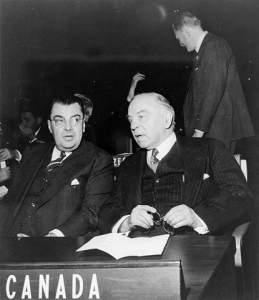 When Martin arrived in Ottawa in 1935 it was to a King government that responded to the Great Depression with resolutely orthodox conservative policies, in sharp contrast to the innovative New Deal to the south. And after the flurry of reform that attended the Liberals’ reelection in 1945, the Saint-Laurent governments after 1948 settled into a comfortable exercise of power from a right-of-centre position hardly distinguishable from the corporate towers of Bay Street, from which – to the exasperation of Tory fundraisers – they drew the bulk of their financial support. This too is an enduring face of the Liberal Party, one that predominated again more recently during the Chrétien–Martin, Jr., era, when deficit elimination and debt reduction were accorded highest priority with an eye to the then rising threat from the Reform/Canadian Alliance. To the despair of both ideological Left and Right, the Liberals have always been a true centrist grouping, tacking this way or that to the prevailing winds. Paul Martin, Sr., and his cabinet colleague C.D. Howe, whose motto might have been “The business of politics is business,” are both firmly embedded in the Liberal DNA. In 1947 Martin was appointed Minister of Health and Welfare, a portfolio well suited to a reform-minded Liberal. But he found himself, in slightly hyperbolic words Donaghy borrows from a contemporary journalist, “a Liberal in a High-Tory cabinet.” Martin’s zeal to expand the social safety net – especially with regard to pensions and medical care – met with fierce resistance from fiscally conservative cabinet colleagues. He also had to negotiate the perplexing thicket of federal-provincial relations and powerful premiers with their own, different, agendas. Still, Martin fought gamely on, working with progressive younger bureaucrats to achieve some success in wider pension coverage, and limited success with better hospital coverage that fell short of his own goal of a national medicare program. By 1957 a conservative Liberal Finance Minister, Walter Harris, granted a miserly $6 per month increase to old age pensions, earning him the sneering epithet of “Six Buck Harris.” This allowed the Diefenbaker Conservatives to outflank the Liberals on the left and contributed to the Tory upset victory in the 1957 election. The Canada Pension Plan and medicare awaited the Pearson years in the 1960s, by which time Martin had moved on to External Affairs. Yet he had kept the flame of liberal Liberalism alive during the conservative fifties. As foreign minister in the 1960s Martin had an even larger arena to advance his liberal idealism, but here he encountered endless difficulties. First was the awkward fact that Lester Pearson already owned the brand of liberal internationalism that Martin espoused, and Pearson continually overtook Martin, first by stepping directly from the public service into the political position of External Affairs Minister in 1948, then by easily surpassing Martin for the Liberal leadership in 1958. Serving as foreign minister under Pearson was always a somewhat uncomfortable assignment as Pearson really preferred to act as his own foreign minister. The Cold War continued to rage, making the practice of liberal internationalist diplomacy problematic in the face of American-Soviet bloc rivalries. The East-West divide imposed a “with us or against us” mentality on a middle power like Canada that was both junior partner in NATO and NORAD and an independent country striving to play its own diplomatic role on the world stage. The Vietnam War was a point of tension between Martin and Pearson, as it was between Canada and the United States. Martin, conscious of much that was amiss in the American conduct of that war, was nonetheless deeply wedded to the tenets of “quiet diplomacy” and wanted desperately to avoid public criticism of the Americans. Pearson’s patience was finally exhausted, however, and he brought down the profane wrath of Lyndon Johnson on his head by publicly calling for a pause in the bombing of North Vietnam in a speech he delivered on American soil. Martin was appalled, but his own quiet diplomacy had come to little. The 1960s were not kind to Martin. Generational change and a decline in deference to traditional sources of authority left him looking increasingly like a residue from an earlier era. His image as an old-time patronage pol did not help. His finely crafted working style of quietly negotiating behind the scenes with elite players to achieve concrete results was increasingly out of fashion. The new generation protesting imperialism, militarism, racism, etc. was growing intolerant of elite governance with its secret processes, demanding transparency and direct action instead. Martin’s deep commitment to a grand bargain between English and French Canada – and the Liberal Party’s crucial nation-saving role in maintaining that bargain – was also severely challenged in a decade that saw the Quiet Revolution in Quebec and the rise of Quebec separatism. Martin’s idea of French-English amity was strictly one of traditional elite accommodation, but this was under increasing strain as the elites themselves fell out over sovereignty, and appeals were made to direct public mandates. Pierre Trudeau’s accession to the Liberal leadership signalled a new and very different face of communal conflict: less English versus French Canada than federalism versus the Quebec state. None of it was any longer the sole preserve of political elites, as two sovereignty referendums in Quebec and the Meech Lake and Charlottetown failures would later demonstrate. Martin, purveyor par excellence of elite accommodation, was caught in the rising crossfire. This became painfully apparent around the visit of Charles de Gaulle in 1967 when the French President delivered his notorious “Vive le Québec libre” speech, likening his progress through adoring crowds in Quebec to the liberation of France from Nazi occupation in 1944. All Martin’s efforts at quiet diplomacy failed to avert this fiasco; he then had to watch unhappily as his boss Pearson in effect declared de Gaulle diplomatic persona non grata. This was clearly not what Laurier had in mind when he declared that the 20th century would belong to Canada. “Compromise” in the 1960s was beginning to indicate lack of principle. Politics, the art of compromise, had become a bad word as well, and compromising politicians untrustworthy by nature. In 1968 Martin went down to a humiliating defeat in his last bid for the Liberal leadership, this time at the hands of a comparative newcomer to Ottawa, Pierre Trudeau, who seemed to promise a new and different way of doing politics. Martin did not run again and was appointed to the Senate where he served as government leader before taking a turn as High Commissioner in London. He died in 1992 before he could see his son Paul, Jr., become Minister of Finance in a fourth era of Liberal rule in Ottawa and then, for a brief tumultuous period, accede to the office of prime minister that had always eluded Paul, Sr.
Martin always believed that politics was the highest calling in life. “I am not afraid to be called a politician,” Martin declared in 1945. “Next to preaching the word of God, there is nothing nobler than to serve one’s fellow countrymen in government.” One can scarcely imagine any politician today being tone deaf or foolish enough to declare such sentiments in a time of populist contempt for public life. But Martin’s words epitomize the Liberal Party’s sense of itself and its mission during the King–Saint-Laurent era, and equally epitomize a failing faith during the Pearson-Trudeau era and later. If Paul Martin, Sr., represents a political world that Canada and the Liberal Party have lost, what comes next? Big Tent Politics is the best guide yet to those perplexed by the surprising reemergence of the Liberals. Others, myself included, have written in detail about particular periods in the Liberals’ long dominance, but Carty has succeeded in summarizing almost everything important about the trajectory of change over more than a century, and furthermore has done so in 133 pages of succinct and accessible prose. This is a model of what Canadian political science at its best should look like. But Quebec defected from the Liberal fold, going over first to the Mulroney Conservatives in 1984, to the Bloc Québécois in 1993 and then in 2011 to the NDP. Chrétien was able to muster three successive majority governments without much francophone Quebec support; instead, he took almost all the seats in Ontario with a popular vote in that province in the low 40 per cent range. This was possible only because of the split on the Ontario right between the Progressive Conservatives and Reform/Alliance. Once Stephen Harper united the right under his leadership, the game was up for the Liberals. Out of office in 2006, their century-long secular vote decline began to accelerate. In the 2011 election the bleeding had become so pronounced that recovery seemed doubtful. The 2015 election might seem like just another blip in a downward trajectory. After all, Justin Trudeau’s “majority government” is based on only 39 per cent of the national vote. But Carty does not look just to voting statistics to explain the phenomenon of Liberal historical dominance. The Liberals were preeminently a brokerage party – hence the “big tent” image of aspirational inclusivity. This set them apart from what André Siegfried, the Tocqueville of Canadian politics, called “natural parties,” those based on stable class/ethnic/religious bases with defined ideological and policy programs. The Liberals were an “unnatural party,” a departure from the Western norm. Canadian circumstances, especially the English-French divide, propped up this unnatural party for a very long time, although as those circumstances changed, the props shifted as well. The Liberals faced their greatest challenge in the early 21st century as the transformation of the media in the age of the internet wreaked havoc with traditional patterns of political communication. 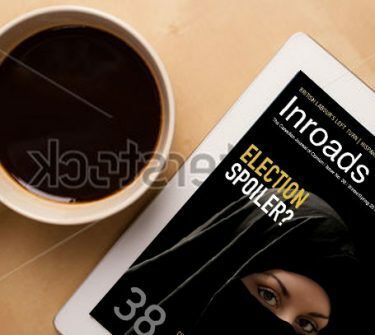 Apparently on top of the latest political marketing trends, the Harper Conservatives looked much more like a natural party of the right, governing always with an eye to their own base of carefully defined voting niches and never shrinking from deploying wedge issues to divide and rule. With the rise of the NDP, it was possible to discern the outlines of a politics more sharply divided along left-right ideological lines. In that scenario the “unnatural” Liberals could only fade further into irrelevance. Instead Justin Trudeau led his big tent party back to office, over the bodies of the “natural” parties of both the right and the left. So far Trudeau has soared in public affection simply on the basis of not being Harper. While that suggests that the Harper makeover of politics was in the end a disaster for the right, it says little about the successor regime. It is far too soon to draw any conclusions about the fifth-era Liberal Party’s long-term prospects, or even what precise shape the party will take. But one thing is already clear. This Liberal government represents serious generational change. How the young, social media–savvy leadership will restructure the Liberal Party remains to be seen, but it will be a very different creature from what we have seen in the past. And yet when Justin Trudeau took to the stage in triumph on election night, he did not invoke his father, or Pearson, or King. Instead he reached back all the way to Laurier and his “sunny ways.” The spirit of Paul Martin, Sr., must have smiled at that.